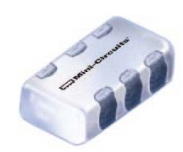 Mini-Circuits LFCN-291-1PM+ is a sharp rejection, dual LTCC Filter designed for use in a variety of applications including a differential filter in an IF section of a heterodyne transceiver system. This filter provides a basic Low Pass structure with a cutoff frequency at approximately 290 MHz. Although it is Low Pass, the design it is not intended to pass DC, nor is it intended to isolate DC incident on the RF ports from ground. 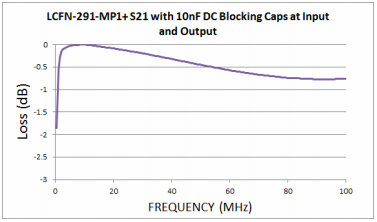 This limitation is due to characteristics in the ceramic structure and, as such, require the user to add DC Blocking caps at the RF ports where DC signal needs isolation from ground. 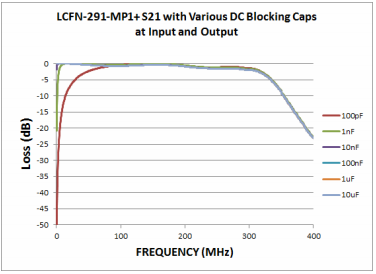 To properly insulate DC from ground, DC blocking capacitors should be used on associated ports of the LFCN-291-1PM+ which are subject to the DC signal. The value of the capacitor is dependent upon the desired lowest operating frequency. For operation down to 500 kHz, a 10nF capacitor should be used. To ensure resonance free operation up to and through the passband frequencies, the capacitor should be of a NPO type. Mini-Circuits recommends the layout shown in Figure 2. This layout is based upon the use of 20 mil RO4350 printed circuit board using a 0603 NPO Capacitor (Murata: GRM188R71H103KA01D). The line widths are 44 mils and DUT ground is supported through multiple vias at the ground pin locations.